Toshio Ota, 75, of Seattle, was reported missing in March 2011; his body was found in the Columbia River 17 months later. In 2016, King County prosecutors charged Kyung Hee Dowdle with murder, five years after she fled to Japan. She was extradited to the U.S. last week and remains jailed. Kyung Hee Dowdle boarded a flight to Osaka, Japan, in April 2011, a month after she allegedly killed a retired Seattle businessman and dumped his body in an irrigation ditch in Central Washington, prosecutors say. 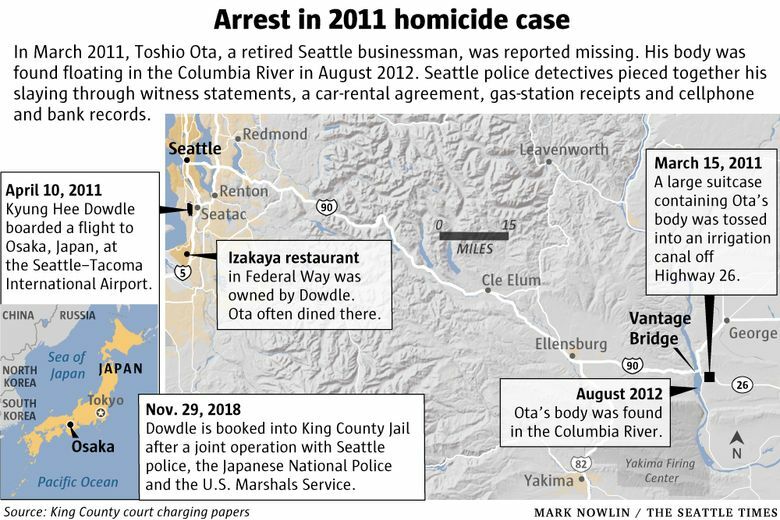 Five years later, Dowdle was charged with first-degree murder in the death of Toshio Ota, a wealthy 75-year-old whose body was found by a fisherman floating in the Columbia River in August 2012, charging papers say. He died from blunt-force injuries to his head. On Thursday, Dowdle, now 48, was booked into the King County Jail, where she remains in lieu of $5 million bail, jail records show. Dowdle was tracked down by Seattle police detectives in a joint operation with the Japanese National Police and the U.S. Marshals Service, says an item posted on the Seattle Police Department’s online blotter. The post does not say when or where Dowdle was arrested or whether she waived extradition to the United States, but the department offered its thanks to Japan’s Ministry of Justice and Okinawa Prefectural Police for their help in the case. Dowdle, who was also charged with four counts of forgery for allegedly writing checks on Ota’s bank accounts and getting away with $16,000, is to be arraigned Dec. 10. She formerly owned Izakaya, a restaurant on Pacific Highway South in Federal Way, where Ota dined two to three times a week, charging papers say. Before Ota disappeared, Dowdle learned he had cut her out of his will and requested that she begin paying $1,000 a month toward a nearly $40,000 loan Ota had given her to help with her restaurant, according to the charges. Police and prosecutors think Ota was killed sometime between March 12 and March 15, 2011. Ota’s building manager contacted Ota’s relatives after newspapers had piled up outside Ota’s condo in Seattle’s Westlake neighborhood, the charges say. His car was in the secured garage but none of his neighbors had seen him. The last phone call made on Ota’s cellphone was to Dowdle on March 13, 2011, at 12:53 p.m., though his phone was never found. The missing-person case became a homicide investigation on April 11, 2011, a day after Dowdle boarded a flight to Osaka, the charges say. Though Ota’s body was found in August 2012, Seattle police didn’t learn of the remains until that November, when sheriff’s officials in Grant County published a law-enforcement bulletin. 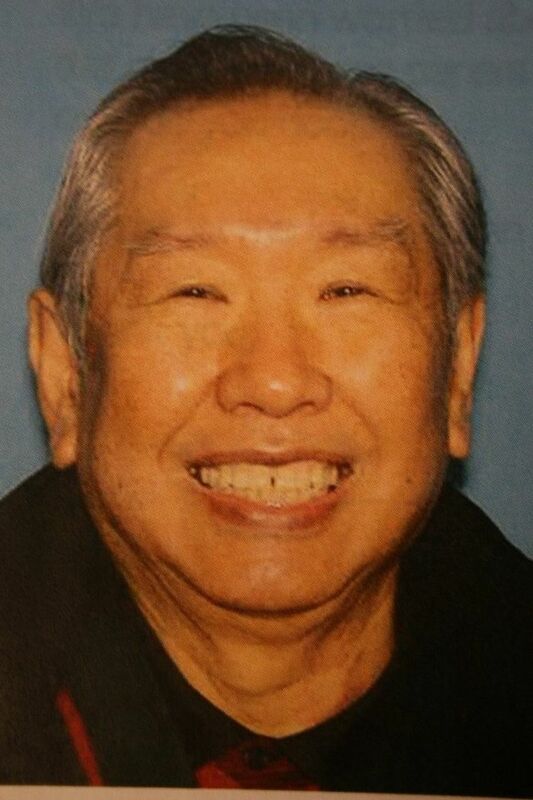 A Seattle homicide detective reached out to the Sheriff’s Office, and Ota was positively identified through dental records in June 2013, the charges say. Detectives pieced together the case against Dowdle through witness statements, a car-rental agreement and gas-station receipts from a trip to Central Washington, as well as cellphone and bank records. According to the charges, Dowdle rented a minivan and paid two men $150 each to help her move and dispose of a large suitcase she said was filled with books. After crossing the Vantage Bridge over the Columbia River on March 15, 2011, the men unloaded the suitcase off Highway 26, tossing it down a steep embankment into a fast-running irrigation canal. Ota’s remains were found downstream from the canal, the charges say.